Google Talk is an instant messenger that allows you to chat and make audio/video conferences with your friends. You can create voice and video calls using a microphone or a webcam respectively. Popularly known as Gtalk, Gmail Messenger or Gchat, Google Talk for Windows lets you chat with multiple contacts at the same time using the Google Chat feature. You get a wide range of features such as sending and receiving text messages, placing audio/video calls, creating group chats, sharing files, listening to internet music, and much more in this instant messaging & VoIP service. Moreover, you can make free PC-to-PC VoIP calls and also leave voice messages. Not only this, but the instant messaging client also allows you to send text messages to your buddies even when they are not online. You just have to enter your message into chat window and they’ll get it the next time they sign in to Google Talk. Download Google Talk to enjoy chatting in a feature-rich and entertaining environment. The free messaging app is also an email notifier that displays alerts whenever a new email is received. In addition, the program also displays the total number of unread emails. One thing that makes the software convenient is its simple and user-friendly interface along with a few customization options. The Settings window comes with options to customize your chat window. You can resize chat windows to make use of as much space as you want on your screen. Furthermore, the Google Messenger lets you select notifications you want to see and even block some contacts from contact list as per your preference. Apart from this, you can also save chat history within your Gmail account so that it can be easily accessed, regardless of the host PC. 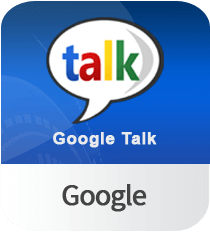 Google Talk is a reliable IM utility with many useful features that work great such as group chat, VoIP, text messaging, voicemail, file transfer, and much more. It’s a perfect tool that gives you a way to stay in contact with your friends globally and allows instant messaging for personal as well as for professional use. Note: Google has replaced Google Talk with Hangouts. However, the application is still in use. We are providing you the last version of Google Talk so that you can chat with your Google contacts using third-party XMPP like Adium.